The vector stencils library Business people clipart is included in the Business and Finance solution from Illustration area of ConceptDraw Solution Park. Use it to make professional looking documents, presentations and websites, advertising, project management illustrations, or any design that requires clipart of currency, money, office, time, contacts and collaboration. 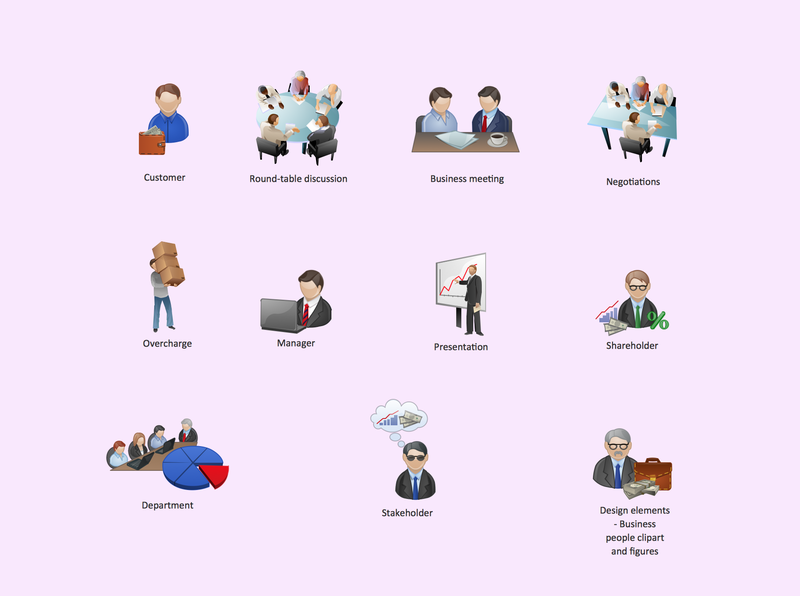 This document "Business people clipart" are vector graphic document. They are available for reviewing, modifying, or converting to a variety of formats (PDF file, MS PowerPoint, MS Visio, and many other graphic formats) from the ConceptDraw DIAGRAM Solution Park. Business and Finance solution from Illustration area of ConceptDraw Solution Park - use it to quick draw illustrations, diagrams and infographics for your advertising and marketing documents, presentations and websites. The vector clipart library Advertising includes 8 concept images. This sample was created in ConceptDraw DIAGRAM v12 diagramming and vector drawing software using the Workflow Diagrams Solution from the Software Development area of ConceptDraw Solution Park. This sample shows the Workflow Diagram that clearly illustrates stages a BPM consists of and relations between all parts of business. The Workflow Diagrams are used to represent the transferring of data during the work process, to study and analysis the working processes, and to optimize a workflow. Many of us want to be able to create designs efficiently yet quickly. ConceptDraw DIAGRAM v12 will help you to make awesome drawings without having to design all those Time Elements. These elements include graphs, symbols, cliparts, visual data representation and a whole lot of other stuff. Designing a workspace or office involves careful consideration of form and function. Conceptdraw offers you all nessesary office design elements in one library. Combine, match, design and create!